Low Mileage, Navigation, Sunroof, Leather Seats, Premium Sound Package, Bluetooth! Fuel efficient and fun, the RAV4 puts enhanced performance and improved fuel efficiency at your fingertips. This 2016 Toyota RAV4 is for sale today. The 2016 Toyota RAV4 boasts a refreshed exterior, premium soft-touch interior materials, exciting new technology, advanced safety features and much more. The RAV4 is a compact crossover that's ready to handle your busy lifestyle with its sporty and spirited performance, impressive cargo capacity and energetic driving characteristics. Sculpted and sleek, athletic and agile, this all new 2016 model features a sharper front and rear bumper design, new wheel designs and the addition of a shark-fin antenna on top! Inside this 2016 RAV4 a newly refreshed interior awaits you. It's improved interior design surrounds you with an array of advanced safety and technology features. This low mileage SUV has just 28000 kms. It's white in colour and is completely accident free based on the CARFAX Report. It has a 6 speed auto transmission and is powered by a 176HP 2.5L 4 Cylinder Engine. This vehicle has been upgraded with the following features: Navigation, Sunroof, Leather Seats, Premium Sound Package, Bluetooth, Blind Spot Detection, Adaptive Cruise Control. It has some remaining factory warranty for added peace of mind. Our RAV4's trim level is Limited. Immerse yourself in this top of the line Rav4 and ride in absolute comfort thanks to its premium leather seats, larger aluminum wheels and automatic full time all wheel drive. This incredible also includes a power sunroof, built in navigation, a larger 7 inch display screen with bluetooth and wireless streaming audio, an 11 speaker JBL premium audio system, 360 birds eye view reverse camera, lane departure warning with lane keep assist, 8 way power driver seat, blind spot detection and distance pacing cruise control plus many more useful and luxurious features! 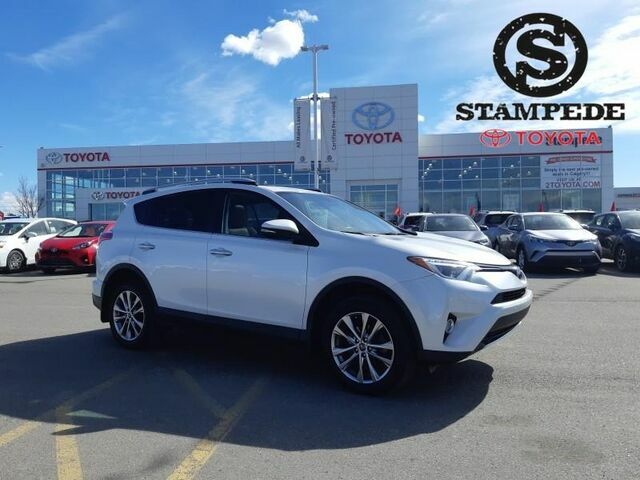 Stampede Toyota's used vehicle department has been proudly serving the City of Calgary for over 35 years. We're Serious About Earning Your Business And WE'LL PROVE IT!!!! We make every effort to present information that is accurate. However, it is based on data provided by the vehicle manufacturer and/or other sources and therefore exact configuration, color, specifications & accessories should be used as a guide only and are not guaranteed. Under no circumstances will we be liable for any inaccuracies, claims or losses of any nature. Furthermore, inventory is subject to prior sale and prices are subject to change without notice, cannot be combined with any other offer(s), do not include provincial or local taxes, tags or registration. To ensure your complete satisfaction, please verify accuracy prior to purchase.